Tianji is more than just China’s leading professional social network, although that position in itself is impressive enough. The service’s parent organisation – Viadeo – has an approach to China that will be of interest to any western web firm considering an entry into Chinese Web space. 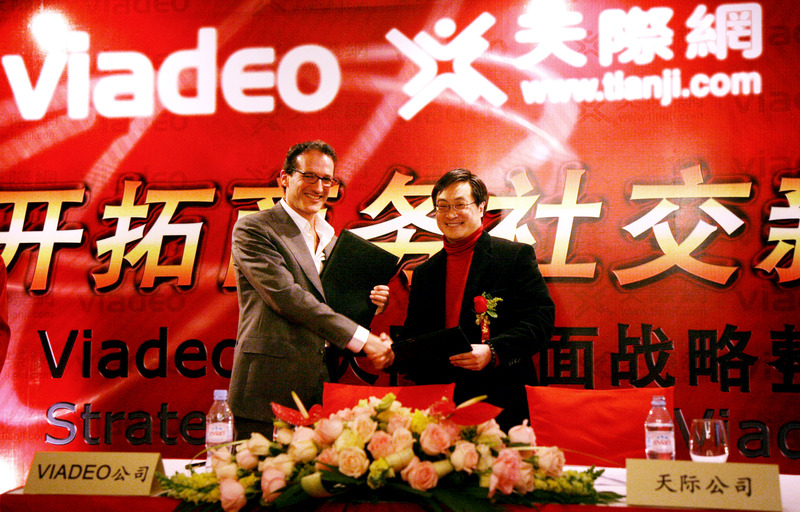 Tianji, which was founded in China by Derek Ling in 2004, was purchased by France-based professional social network Viadeo in late 2007. There was no specific focus on Tianji, which retained its name and brand, after the aquisition and it joined Viadeo’s other purchases which include Spanish professional social network ICTnet — which is hugely popular in South America — and Canada’s unyk.com and the rest of its international network. Together the network gives Viadeo, which boasts 40 million registered users, a worldwide reach that is second only to LinkedIn in the professional social networking space today. In the rapidly growing Chinese market, Tianji is out in front with 9 million users, ahead of rival Ushi and LinkedIn, the latter of which has just one million users in China. However, it wasn’t until this year, and the boom of social media in China, that the company developed a clear plan and focus for China, as Viadeo founder and CEO Dan Serfaty told The Next Web. Serfaty, who moved to China with his family in September to focus on developing a greater emphasis on the market, reveals that Tianji’s 9 million users makes China Viadeo’s biggest market. It isn’t just that its share in China is big, it is growing quickly too. This year alone, Tianji has seen its impressive rate of 100,000 new users per month (in January) grow to reach 380,000 new sign-ups in October. As we recently wrote, Tianji estimates that its current user base could grow to reach 35 million in 2013, which – according its predictions – would give it more than one third of China’s 100 business network users. This potential to grow is spurring greater investment for Viadeo with Serfaty revealing that the company is planning to triple its investment in China. The current Chinese staff of 30 – of whom the CEO admits just a handful are strong English speakers – is expected to increase to 200 by the end of next year. Unlike other Western companies in China however, the team will remain predominantly Chinese in line with Viadeo’s determination to be a locally-relevant player in each of its market, as Serfaty explains. Tianji stands uniquely against the rest of the Viadeo network, quite literally, as the site is kept separate from the rest of the Viadeo network. Though Chinese profiles can be read in English, users must sign up to Tianji to use the service, for now at least. “Tianji has been created as an entirely separate site but it uses the same APIs as Viadeo so developers creating applications or services are easily able to do so for both,” says Sarfaty who also revealed that the set up could allow Tianji to be merged with Viadeo very easily, a possibility that the company will explore in the future. On the subject of China’s notorious online censorship, Tianji has a dedicated team of two which handles all membership communications and works with the government. Unlike Sina Weibo however, Serfaty admits that, until now, there have been no censorship issues as professional users are “less likely to cause trouble”. Everything about the Viadeo/Tianji approach in China – from making a local acquisition, maintaining a Chinese identity and separating it from the rest of the network (for now at least) – are the types of tactics that Facebook, Twitter and other social networks have been linked with adopting to enter China. While China frustrates Twitter cofounder Jack Dorsey and Facebook’s Mark Zuckerberg has “no immediate plans” to enter the market, Tianji’s progress might well draw a keen audience outside of China looking to gauge the company as a ‘live’ example or yardstick for future entries.